LGS-301 acoustic noise generator is designed to protect voice data against interception through the direct acoustic, vibroacoustic and optico-acoustic channels. 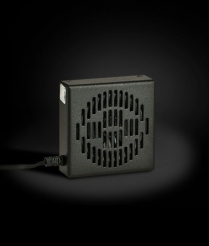 The device is intended to protect the voice data in a standard room with an available 220 V power line. The operation principle of LGS-301 is based on generating white noise in the acoustic frequency band, and, thus, increasing the acoustic noise - voice signal ratio.The generator can protect a room with the volume of up to 50 m3. If you work in a bigger room, you need to use several generators.